Where this notion comes from, and the (mis)information surrounding majority rule, is the subject of this and a future post. Welcome to the Group Income blog! Group Income is a fair, efficient, decentralized Basic Income system for you and your friends. And this is our blog where we will provide semi-regular project updates and discuss the concepts and design decisions that are going into the code. We’ll start by diving into the concept of voting, a process that plays a critical role in Group Income and elsewhere. Like many people, you’re probably OK with, or at least used to, the idea of majority rule. But have you given thought to why we use it, and what it means? However, that is only partially true if the group decided—formally and beforehand—that every proposal, no matter how divisive or controversial, will be decided by majority rule. Perhaps this method of making collective decisions is not always the best way to go? Let’s consider some examples of real-life group-decision making. It’s also important to ask: who is affected by the decision? Is it just the group members, or those outside of it? If outsiders are affected, how many and in what way? In the United States, a “Congress majority” is 0.00008% of the U.S. population, and this group (along with a few others1) decides the rules of behavior for about 300 million people outside of it. Is this a good idea? Are there better alternatives? And if so, what are they? These are some of the questions we’ll be exploring in our posts. We invite you to think about them and share your thoughts with us in the comments. Consider your group of friends. You have a decision to make, “What movie should we go see tonight?” What do your friends do if some want to see Movie A, while others, Movie B? Negotiate or debate. This often happens in small groups (2 to 4 members). Do a majority vote and give a concession to the losing side (perhaps to watch the other movie next time). If the group is big enough, the group can split up and each side can see the movie it wants. The moviegoers’ stakes are much smaller because their decision doesn’t impact 300 million people. The moviegoers group is much smaller (2-10 members vs. 435 voting members in the House). For the moviegoers, splitting up instead of voting is an easy choice that can satisfy both sides. The House of Representatives cannot pass two conflicting laws, and if it does it’s usually considered a problem. The majority vote in both situations involves making concessions to the losing side, at least sometimes. The moviegoers do not consider their decision a job. They’re not paid to decide, they decide, and then pay. Going to the movies is unlikely to follow a formalized schedule, nor are there formal proceedings to follow. The moviegoers do not go in to the decision expecting a battle, and their decision-making doesn’t take as long. Moviegoers often allow individuals limited power to fully veto a majority decision (e.g. “I’ve already seen it” or “Can’t handle a ____ movie right now.”) House of Representatives requires convincing other reps, or hoping for Presidential veto. Moviegoers often allow each individual a chance to voice their preference and reason, especially if there’s not consensus. There’s simply no time to do this on every vote in the House of Representatives. It’s also worth noting that most moviegoers seem happy after their decision. Sometimes majority rule seems like a suitable voting rule to use. Other times, especially when stakes are very high and very personal, a rule that requires greater group agreement is preferable. A jury that’s deciding whether or not someone is guilty of murder. After all, who wants to risk being directly responsible for incorrectly sentencing someone to life in prison or death? Modifying a Constitution or the Bill of Rights. The protocols that power the Internet and Bitcoin. See also Christopher Allen’s wonderful overview of different types of consensus rules. There are also submajority rules, but we’ll cover those another time. Deciding the Group’s mincome level. Deciding whether or not to add a member. Deciding whether or not to remove a member. Deciding whether or not to change the rules. You can set different rules for different actions. Once you set the rules, you cannot change them. Not without a vote, at least. Those who join your group are giving you their consent to abide by the rules, and you, in turn, are giving your consent to them that you won’t modify those rules without receiving approval from the group. Our goal is to ensure that nobody (not even the developers of Group Income) can change the rules without following the rule for changing them. There are two types of voting thresholds to consider: the turnout threshold and the abstention threshold. The former only cares about those who make a decisive vote for or against, while the latter counts abstainers as a third type of vote, thus increasing the likelihood of impasse. What voting threshold is appropriate for what types of decisions? In other words, do you use submajority, majority, or supermajority rules? How do you count those who abstain from voting? In other words, do you use the turnout threshold or the abstention threshold in making the decision? Should there be a minimum number of “yes” votes, regardless of the turnout threshold, before a motion is allowed to pass? How much time/notice needs to be given prior to a vote? Is voting anonymous (like during an election) or out in the open (like in a board meeting)? Can votes be delegated to someone else? If so, is it a liquid democracy (like DemocracyEarth)? How does the group size affect the voting system that’s used? Do you need to guard against the sybil attack? Do you weight votes based on some criteria? Does your voting system account for someone’s knowledge-of or vested-interests-in the issue? Can people express how important an issue is to them (e.g. quadratic voting)? Can people order their preferences among a set of options to avoid “splitting of the vote” vote manipulation? Are vetoes allowed, and if so how are they handled? Who is allowed to make proposals in the first place? Are people outside of the voting group affected by decisions made by the voting group? Do you allow any proposal or do you handle them differently depending on their actual content? Is your voting system secure? And remember, some types of decisions are better decided without a formal vote! That’s All For Now! Happy First Blog Post! ? Thanks for reading our first blog post! We hope you’ve enjoyed it! If you like what you see here and are interested in participating in this project (whether as a contributor or to take part in pilot studies), please get in touch on Twitter, Gitter Chat, or on our forums! Post by Greg Slepak, with help from Andrea Devers, Trent Oswald, and Simon Grondin. More project updates, hackathons, and blog posts coming your way! Up Next: We’re taking on the fascinating world of Social Choice Theory. How much of it is true? How much is a crock? Please empower our work by donating! But how would the system allow “voting” if you are not harvesting agreement but objections instead? This is how it is do e in sociocracy. Hi James, thanks for the pointer to Sociocracy! I think you bring up an excellent point! An optimal user interface for an objection-based system would probably be different from the one we show above. Based on my brief reading of Sociocracy it seems like a very passive method, i.e. its “security” rests on there being diligent/intelligent folks to object to proposals that are being made. If, for example, a proposal is made during the holidays, and if it is time-based to automatically pass if there are no objections, then that can lead to certain unwanted attacks that rely on people not paying attention. That is not to say that Sociocracy is bad or anything, just that that is one question that I have about it and am curious how it handles it. Something in the middle might be what we discussed in the post, which is to make the voting be based on the turnout threshold. That way you’re still required to gather at least some agreement, but not as much as would otherwise be necessary. Nice write up Greg! I knew you were interested in BTC but didn’t know about this project. These are all things we have been designing into our voting system at Co-op Source. The difficulties seem to come from balancing tradeoffs between fairness, simplicity, security (Sybil attacks), applicability to different decisions, etc. Looking forward to following this group’s learnings in this area. Cooperatives depend heavily on member input and stress fairness, transparency and accountability so the way decisions are made is critical. Traditional coops usually have social or legal mechanisms that mitigate risk of getting these things wrong but an online system is more vulnerable to manipulation as TheDAO found out. We considered their approach earlier but decided against it for obvious reasons. 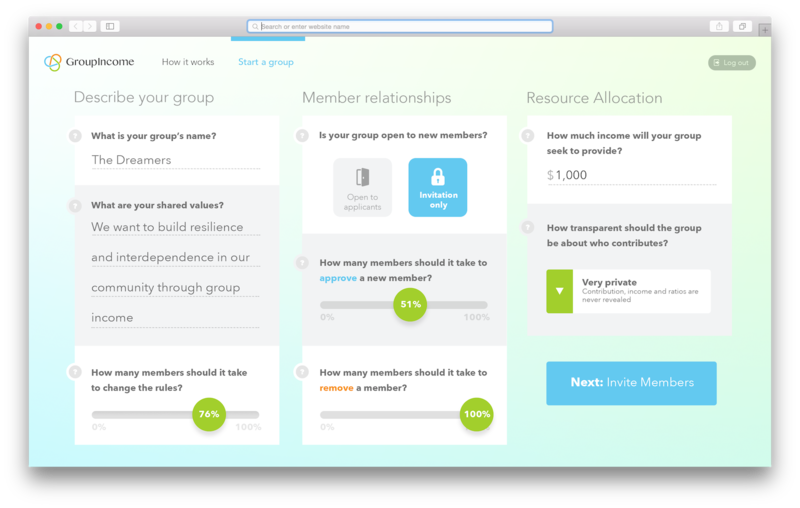 The constitution chart UI mockup shows 51% to accept new members and 76% needed to change the rules. Let’s say I’m an outsider who wants to change the rules. I know I need membership, and then 76% agreement to make my rule change. So once I satisfy the entry requirements, I can test my rule change. Maybe it’s only 10% in the current group. So my next choice is to turn to recruitment. If I can find others who agree with my rule change, and want to join the group, I can facilitate their entry en masse in order to pad the group with members who support my agenda, trojan-style. This manipulation is very likely to dilute the original values, intentions, and agenda of the original group — members with more time invested in the group, perhaps it’s originators, visionaries, and moral guides. If I succeed in my rule change (perhaps the rule change was to bring the “remove member” threshold down from 100% to 76%) then I am positioned to “take over” the group. Moreover, the recruitment process can’t effectively screen new members against this. As a member, if I know one of our entry requirements is “must not want to change the removal rule!” then I can tell my external recruits to lie about that to gain entry to the group, then turn on the others, change the rule, kick them out, take control of the group, and (worst of all) take control of the group away from others. I mean this is an extreme scenario, but it’s a systemic risk, and I don’t know how to mitigate it. Note that the principle of member dilution can occur regardless of the consensus thresholds in the constitution. What do you think of this risk rule trojan? And how to mitigate? Hi Michael, thanks for your comment! This article approaches from the one man – one vote idea, but what about IRL monetary voting where those who control the monetary supply can de facto buy the votes they need to pass a decision? Also, in current cryptoworld, voting is mostly done by coins/tokens (and-or by deciding which ecosystems and their forks you participate). This idea began as ironic idea for a political party that openly auctions how their representatives vote, political party called The Corrupt Party, but developing the idea in further detail I realized that there’s more to the idea, especially for basic income cryptocurrency systems. The basic idea could be called ‘Robin Hood Voting System: there are many ways to organize the power of initiative, and for each initiative there are two accounts: FOR and AGAINST. As above, various supermajorities can also be defined. The new(?) idea is that the money/tokens from the losing account is returned to senders, and the money from the winning accoung gets equally distributed to all members of group/community. This means that any time a group of voters get a decision that they favor, they lose their relative voting power to those who lost the vote or abstained. This inbuilt dynamic has strong preventive effect on continuous dictatorship of (super)majority. I think that as part of the trials we’ll do with the prototype we can design the voting system to be generic, and support any voting scheme that people want to use, including this one. Perhaps we can recommend a few defaults to pick from, and I think this would make a good candidate for certain types of decisions. It’s important to remember that there is no “one-size-fits-all” voting rule, and for adding or removing members, I think I’d still personally choose to go with 1-person-1-vote, as that just feels more appropriate to me for whatever reason. However, I’m always curious how others feel.